Q. I seem to remember reading about mass extinction of sea life in the bible but I cannot pinpoint where I read that. Can you elaborate on the subject? 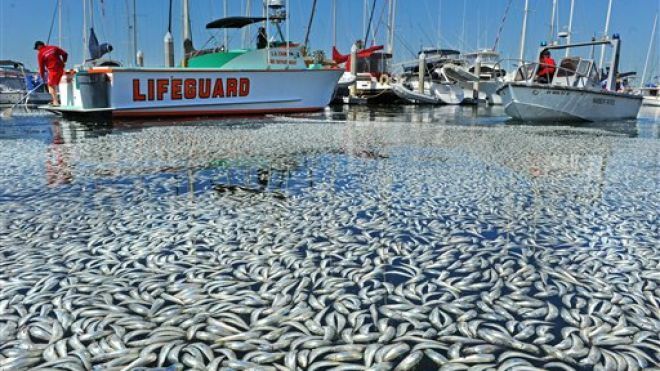 In the news recently there seems to be multiple reports of mass deaths in sea life (and other animal deaths) from various parts of the world. I am concerned about these events being part of the last days scenario of the tribulation period, but I had always thought that these events would happen during the tribulation as opposed to happening now while the church is still present in the world. A.The Bible indicates there will be great disturbances to the oceans and their sea life during the period proceeding the return of Jesus. The book of Revelation describes a series of sequential judgments  which come upon the world to test those who dwell on the earth (Rev. 3:10). It is my view that one of the reasons the earth and sea suffer during these judgments is that the creation will have become an idol (along with the heavens) so God judges these idols by destroying them—prompting people to trust in the Creator rather than the creation (cf. Rom. 1:25). At the sounding of the second trumpet, “something like a great mountain burning with fire was thrown into the sea, and a third of the sea became blood. And a third of the living creatures in the sea died, and a third of the ships were destroyed” (Rev. 8:8-9). At the pouring out of the second bowl, “[the sea] became blood as of a dead man; and every living creature in the sea died” (Rev. 16:3). For another thing, the events of the book of Revelation are anchored within a much larger prophetic framework related to the period leading up to Jesus' return in judgment. Because many Christians dabble with Biblical prophecy rather than developing a systematic understanding of all that the Bible has to say on these issues, they lack an understanding of the historical context within which the prophetic events are to take place. Without this important context, it becomes much more difficult to know what may or may not be related to a biblical prediction. My recommendation would be to devote less time to watching the news and give more time to systematically studying the Bible in order to develop a sound understanding of the historical framework within which the Biblical judgments are to come forth. Once you have this background, you will be relatively immune to the sensationalizing of God's Word so common in our day. Thus, you would know that the events related to the second trumpet and second bowl cannot possibly be occurring today because they are immense and cataclysmic disturbances to the natural world and the historical prerequisites related to the period have yet to occur. Revelation Commentary: Recapitulation of Events, SpiritandTruth.org.